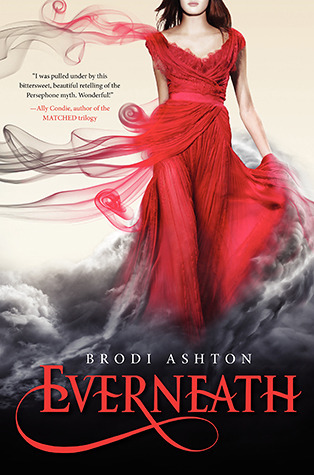 Book Review: Everneath by Brodi Ashton - Book.Blog.Bake. I’ll admit I was hesitant to pick up Everneath. I was compelled by the summary, but I was afraid the book would fall into some of the stereotypes of paranomal YA that I have a hard time handling; specifically, that it would encourage jerky behavior from its male leads and uphold that type of behavior for a love interest. Luckily, the book totally exceeded my expectations. I loved that the premise on this book was based upon Greek mythology. I’m not as familiar with mythology as I would like to be, so I haven’t read as many stories with that focus, but I appreciated how the story was adapted based upon Nikki’s character. I’m sure if I knew my mythology even better I would be able to see more nuances and allusions, but even with my limited knowledge, I found the idea of everlivings fascinating and beyond horrifying. Nikki is at times, quite a mess of a character, but she’s also compelling. She definitely has some self-destructive tendencies, but can also be really self-determined and convinced what she’s doing is right. I think I would have been slightly annoyed with Nikki at times except I could never stop feeling sorry for what had happened to her. The idea of someone else feeding off your energy for a century, leaving you a broken shell, is enough to make me literally cringe. Jack and Cole are both fantastically written characters. They’re both intriguing in their own ways while being complete opposites of one another. Jack is the perfect, steady character that Nikki really needs when she returns, even if things between them are incredibly awkward at first. I like that at first we don’t know exactly what Jack’s role is, since the book is told from Nikki’s POV. I felt like I was figuring Jack out as Nikki was figuring him out for the second time. There is just so much going on in Everneath(in a good way!). You can read it as a mythological retelling, or as a story of the foundation of love, but there’s a lot of undercurrents about the price of immortality, what constitutes a human being, and who heroes are. These aren’t all themes that might be evident on a quick read-through, but they’re definitely prominent enough that I feel they should be acknowledged. These underlying tensions are really what compels me to the series, and why I want to keep reading. Final Impression: I wasn’t sure if I would like this book or not, but I liked the different take on mythology that I feel isn’t explored as much as some other lore. Even though Nikki had some pretty self-defeating behavior and thoughts sometimes, I never felt like I didn’t get where she was coming from. The way the characters are written and the subtle themes that run underneath this work make this a 4/5 star read for me. You can find Everneath on Amazon, Barnes and Nobles, or The Book Depository. When I bought Everneath I admit that I did so mainly because of that gorgeous cover.Later on I was a little wary because it seemed to have the dreaded love triangle.But it looks like the romance was not that horrible? I love the fact that the book broaches deep stuff like what what constitutes a human being and who heroes are.We need more of that in YA books. Romance wasn’t bad at all! I don’t think it had a love triangle, at least not in the strictest sense. Yes, there are two boys who both want the affections of Nikki, but I don’t really consider it a love triangle because the main character is never really trying to decide between them. Not a love triangle on her end, at any rate. I really liked that because I was wary of a potential love triangle as well. I also bought Everneath when it was on sale for Kindle. My skepticism for this book derives from the fact that it’s based on Greek mythology, but very loosely. I know much more than the average person about Greek mythology and I did read somewhere that Ashton doesn’t really adhere to many of the tenets and myths, so I’m a bit worried I’ll be nitpicky over that. But your review now adds to the many positive reviews I’ve read, so I really do want to give this a chance! Plus I also picked up the sequel Everbound on sale for my Kindle, so I do need to start this series! I definitely don’t know that much about Greek mythology, so that’s one reason I think I enjoyed this book more than I did. Even if I hadn’t known it was based on mythology, though, I think I would have still enjoyed it, so hopefully the plot will carry itself. Hope you enjoy!